Let’s head back to 70s and 80s when no action movie was complete without a car chase and a pile-up. 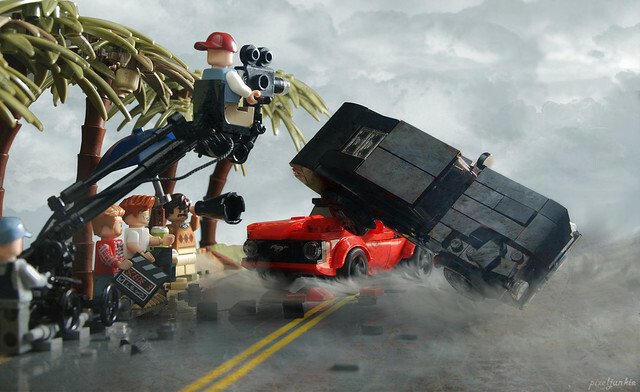 Check out Pixeljunkie‘s piece of Muscle-Car Movie Mayhem. This shot looks like a behind-the-scenes publicity image straight off the film set. There’s the director bellowing through his megaphone, the guy with the all-important clapperboard, and a nicely put-together boom camera capturing the action. The crashing cars themselves are simple enough models, but they’re well positioned. In conjunction with the dusty smoke effect, the dynamic angles suggest a high-speed crash, captured at the perfect moment. 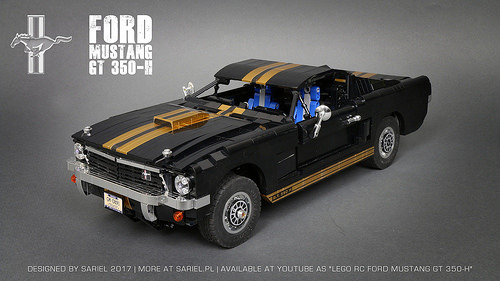 You may have noticed an abundance of Ford Mustangs featured on The Brothers Brick lately. 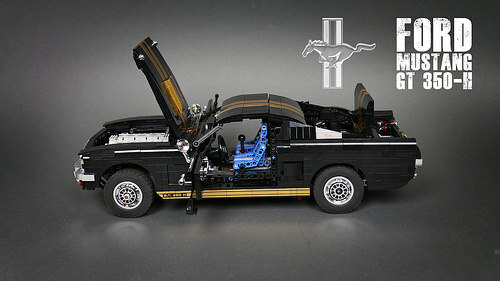 The recent trend was ignited by a LEGO IDEAS contest, celebrating the Mustang in beautiful scenery. 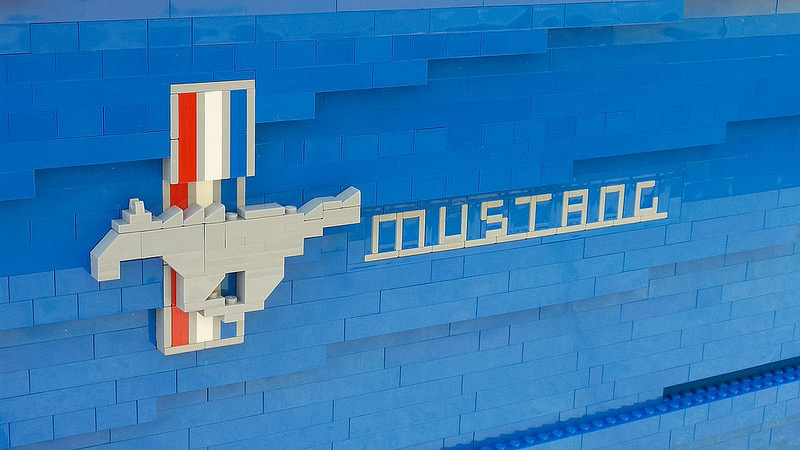 After wowing us by finding a Mustang in a barn, Andrea Lattanzio’s latest creation finds this Mustang in the shop. While the car itself is flawless, focus of the contest is on the scenery. And this garage is spot on. 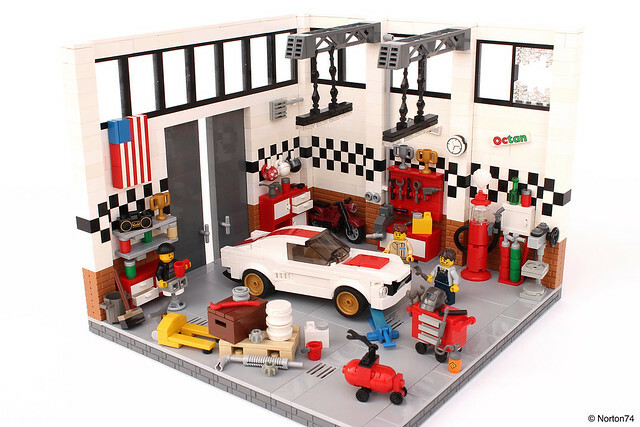 The structure is rife with subtle yet brilliant techniques, from the checkered pattern on the wall – alluding to the shop owner’s dreams on race day – to the broken window adding that extra dose of realism. My favourite technique is the droid arms and skeleton legs suspending the overhead lights. Not to be overlooked is the apparent master class in brick built garage and warehouse tools. The pallet jack, air compressor, drill press, gas pump and table vice are all amazing details that help make this garage beautiful. 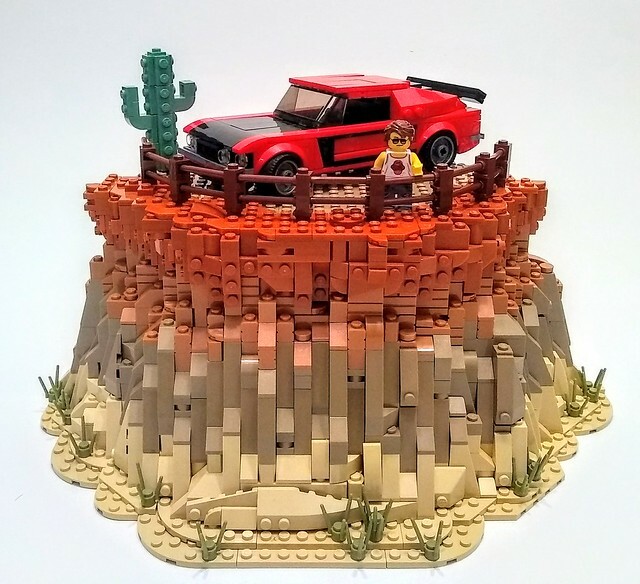 Some LEGO builders say that architecture and scenery merely exist to serve as backdrops for cars or trains. Looking at this display built by Andrea Lattanzio, I beg to differ. 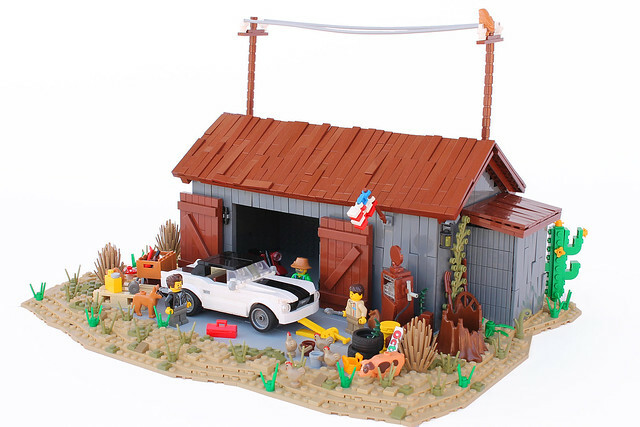 While the classic first-series Mustang Hardtop is beautiful on its own, the barn behind it is equally delightful. Andrea achieved the barn’s dilapidated look through effective use of brown and dark grey tiles, which are not pressed down all the way. Personally, I find it difficult to ignore the satisfying feeling of pressing two LEGO pieces together but, when they’re tilted just a little and with varying degrees, the rustic charm is undeniable. Other highlights include the rusty broken gas pump and an American flag, which is cleverly formed out of plates with clips in such a way that makes it look as if it’s waving in a light breeze. The car itself cannot be overlooked; the lines are sleek and the construction is smooth. Curved slopes on the hood are ideal parts in creating the perfect angle, and the use of clear slopes for the windshield is simple but feels representative of a real Mustang. 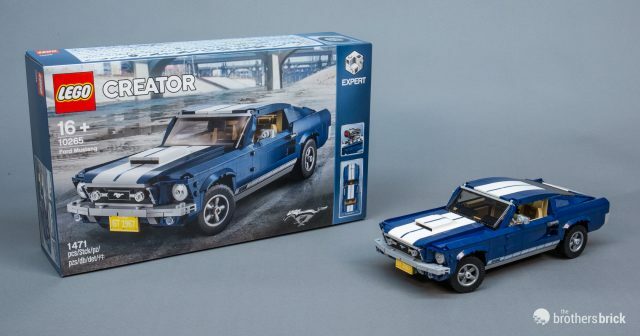 LEGOLAND Florida and Southern Ford Dealers have partnered to create a truly unique anniversary gift: the Brick Pony is a bright blue 1964-1/2 V8 Coupe Mustang, and she is just lovely. 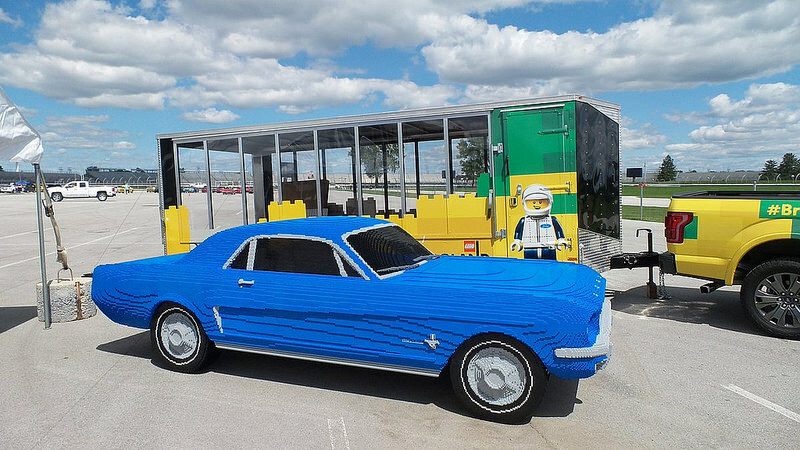 This life-size LEGO build was created to celebrate the 40th anniversary of the Mustang Club of America, and was unveiled at the Indianapolis Motor Speedway.